Although, there are tens of other chairs in the market but Kahuna massage chairs have established a reputation as the best sellers owing to their superior design, performance and customer satisfaction. Kahuna massage chairs are mainly available in two different models. 1. Shiatsu, 2. Kneading, 3. Tapping, 4. Knocking, 5. Tapping+Knocking combo. For the sheer number of features offered by Kahuna LM6800, the price is remarkably lower than other massage chairs. Although, other brands too offer similar features but the catch here is mainly the price followed by performance, longevity and the exceptional support services offered by Kahuna LM6800. Before we move into in-depth analysis, following table covers quick specifications. 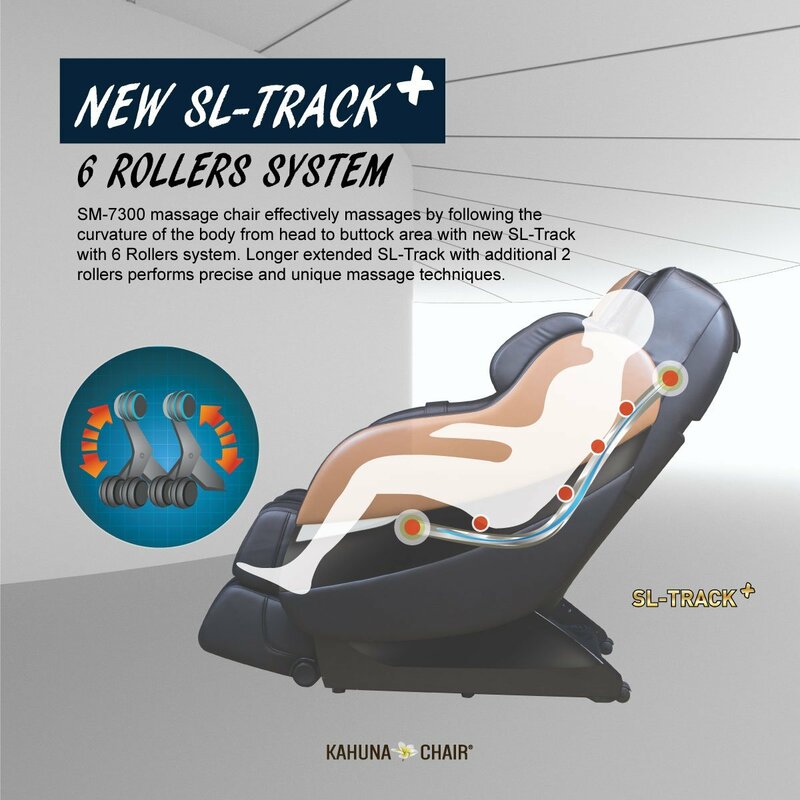 L-track roller model, although a high-end design seen only in expensive massage chairs, but still Kahuna has got the same incorporated in its LM6800 model. In L-track design, the rollers massage all three areas in the upper body – the neck, lower back, and glutes. 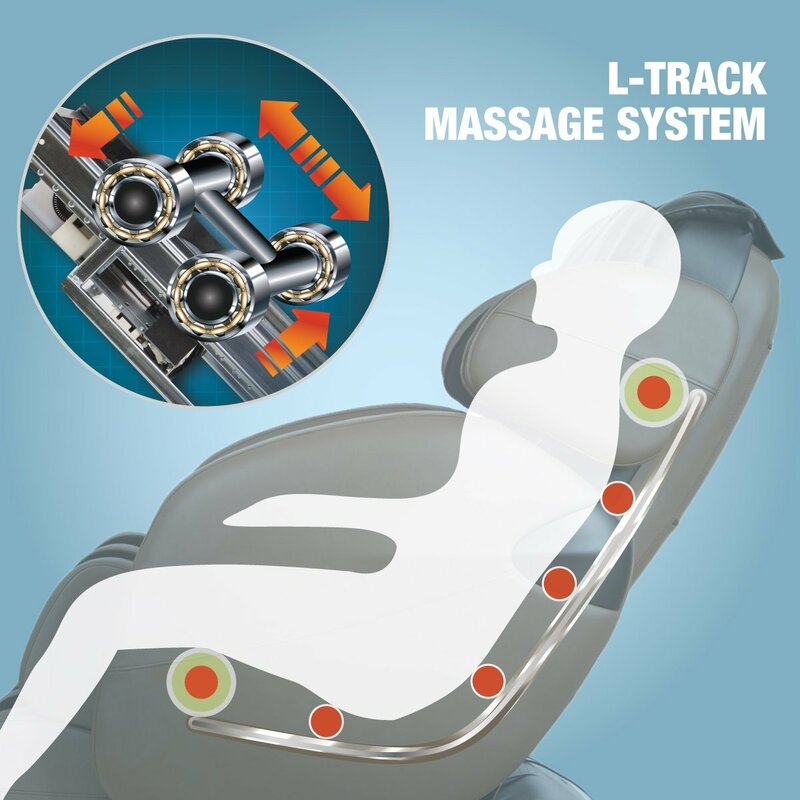 Whereas, in S-track design, the rollers massage is limited to neck and lower back. If you take a quick look at the following image, you will understand that the dual rollers in Kahuna LM6800 move all the way down to the glutes. LM 6800 is designed for weights up to 240 lbs and 6 feet 2 inches height. This position is dedicated to ultimate relaxation. And this is why, most products that are designed for relaxation have zero-gravity positions. Best examples are adjustable beds. Every adjustable bed, be it high-end or low-end, offer zero-gravity as a preset position. 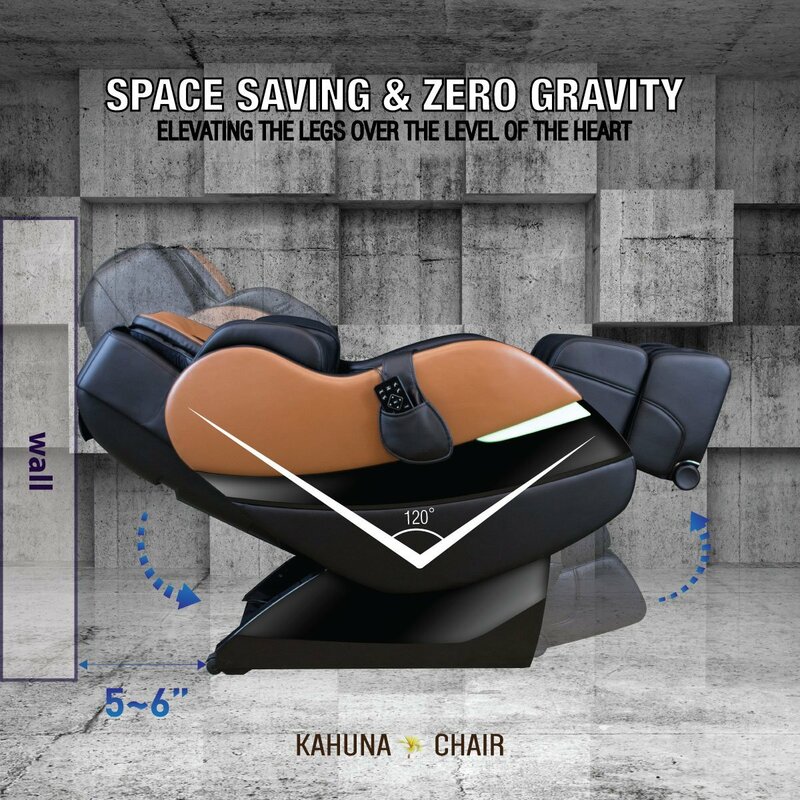 Kahuna LM6800 offers 3 stages of zero-gravity positions. One size doesn’t fit all. Same is the case with massage chairs. They should have the intelligence to calculate your height and accordingly customize its functions to precisely reach pressure points as per your body stats. Body scan function in Kahuna LM6800 does exactly the same. It first scans to determine your exact body measurements and only then it initiates the massage functionality that precisely targets the exact pressure points. Kahuna has really done extensive research on its prototypes before coming up with just 36 airbags in its LM6800 model, as this number is relatively lesser than the number of airbags installed in other massage chairs. And finally, their design paid-off as the massage functionality offered by these 36 airbags is a big match and on par with the experience offered by high-end massage chairs. 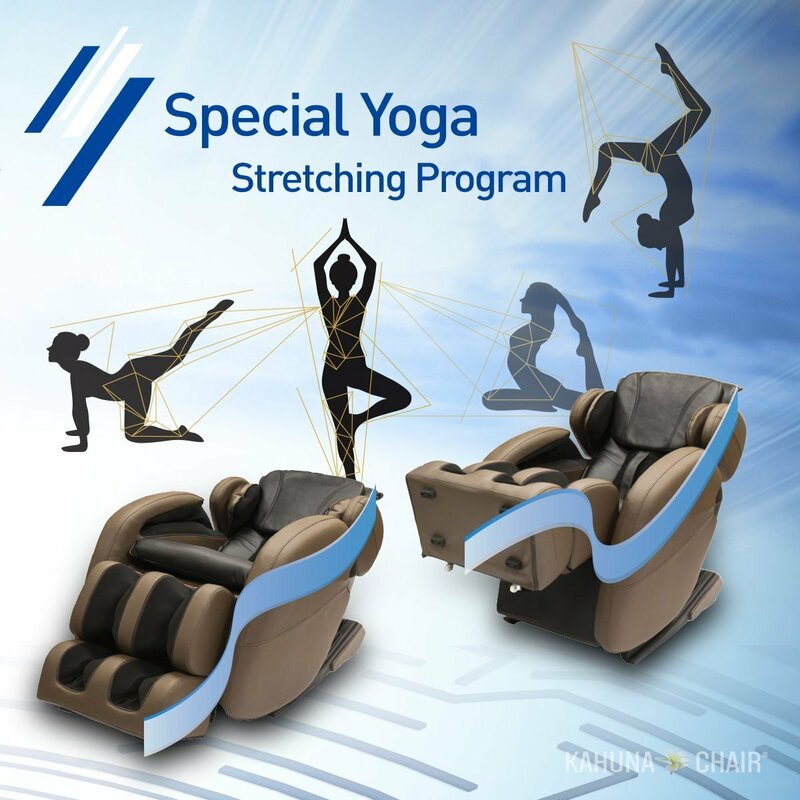 Kahuna LM6800 also has an auto Yoga program preset on its remote. If massage feature helps relax strained muscles then stretching of limbs in Yoga style is equally important to avoid buildup of muscle contraction. Shiatsu is not just about massaging around pressure points of the human body using thumbs, elbows or hands. But it is also about releasing energy that is accumulated around these pressure points for a long time. Applying pressure to these critical areas along with stretching of joints and limbs in the right way helps relax muscles and release blocked energies from our body. This again results in overall relaxation of both body and mind thus resulting in the effective functioning of nervous and immune systems. 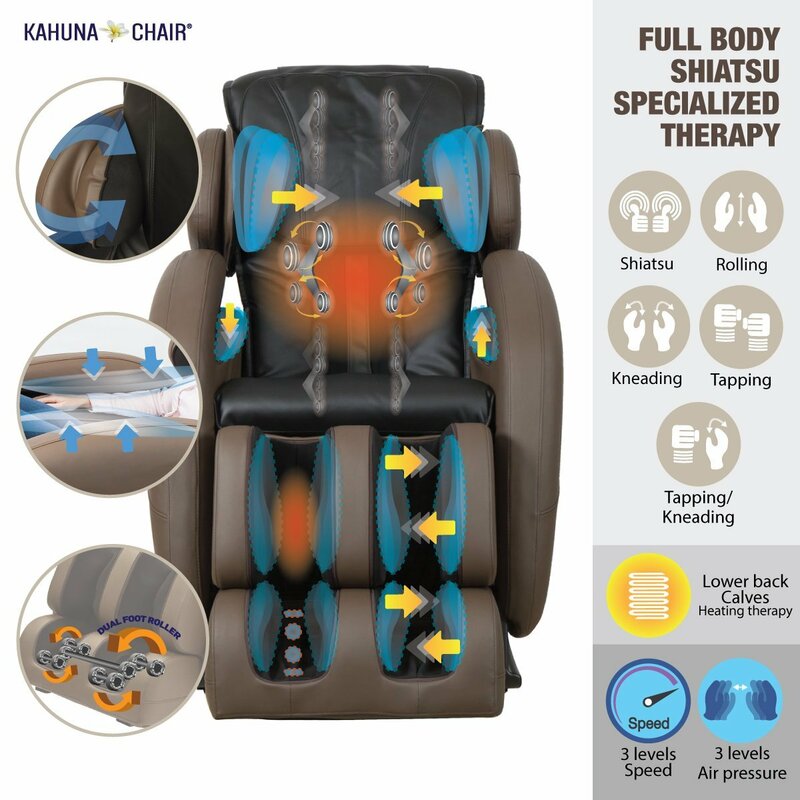 Kahuna LM6800 Shiatsu function helps replicate this traditional Shiatsu therapy. Although, it is not as perfect as done by humans but it is definitely the best offered by any machine. Full body massage is incomplete in most low-end massage chairs as it’s difficult to have foot rollers integrated at the stated price range. However, it’s not the case with Kahuna LM6800, it comes with dual foot rollers. Perhaps, this is why LM6800 model is preferred choice in this category. The cotton made upholstery in foot section is removable and washable. The first thing that comes to mind when someone plans for a massage chair is space. Yes, massage chairs do take extra space than your regular chairs. Especially, in a position like zero-gravity, both the head and foot sections are in extended raised position. This takes several inches of space, sometimes even up to 15 inches. Whereas, in Kahuna LM6800, it just takes mere 5 inches extra space and thus is also known as the best space saver massage chair as well. Kahuna offers 3 years limited warranty for its LM6800 model. Warranty is applicable to structure, framework, parts, and labor. If you are looking for a massage chair at this price, then there is no need to scan through several options. This massage chair from Kahuna Superior SM7300 can be chosen with no second thoughts. Just look through the following feature snapshot. 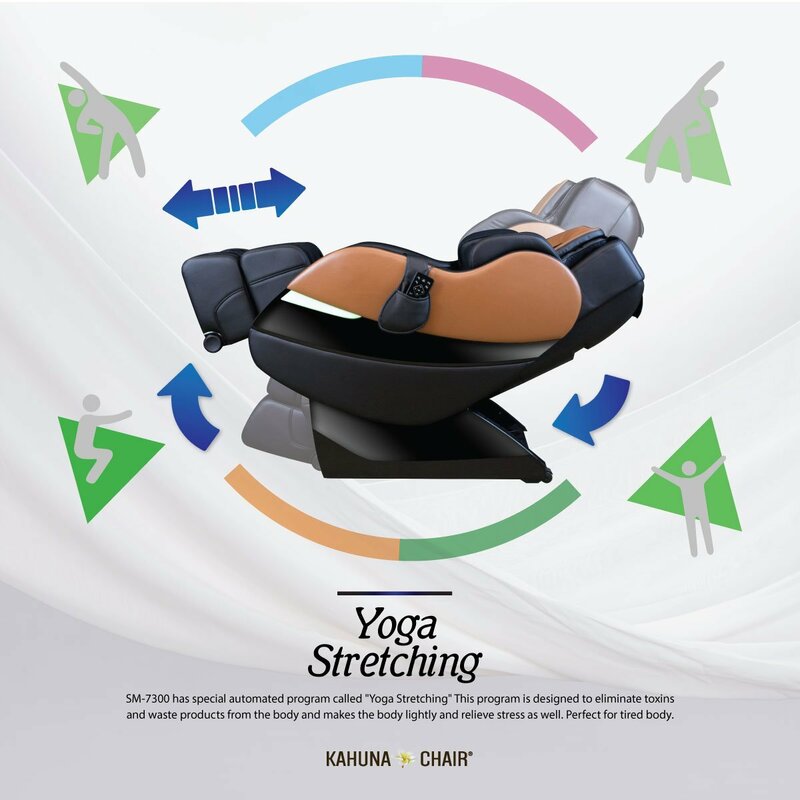 Kahuna Superior massage chair employs SL track design, a combination of both S track and L track designs. While the focus of rollers in S track design is restricted to upper back and lower back massage, but in L track design the rollers move all the down to glutes and thighs as well. And instead of 4 quad rollers, typically seen in most chairs, this SM7300 model from Kahuna has 6 rollers. 6 roller massage provides exceptional massage experience as they reach every inch of your back, no matter how tall or how wide your body stats are. As mentioned in the introduction, it has been specifically designed to even cater to tall individuals. And anyone around 6 feet 5 inches is prone to have wide shoulders and upper back. Regular 4 roller massage might not cover entire back in case of such individuals, hence 6 rollers have been embedded in the backrest. 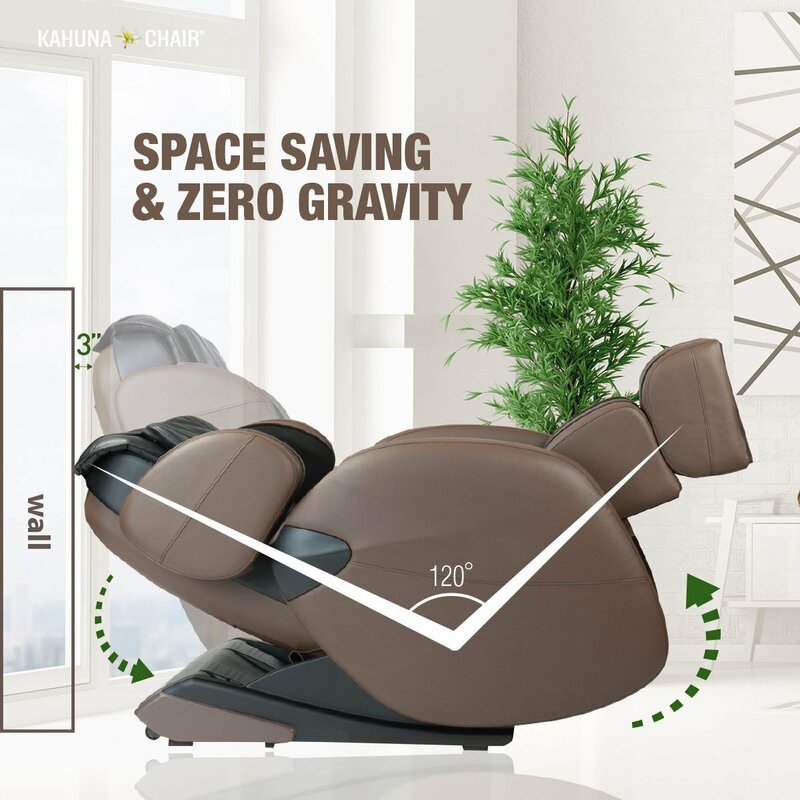 While body scan feature in most regular low-end massage chairs is limited to measuring height and width, the 3D body scan installed in Kahuna Superior has the ability to measure every inch of your body stats. This way the rollers perfectly adjust to your body shape. Moreover, as you have six rollers in the backrest, there is no scope for missing at the critical points. However, if you still wish to adjust the rollers, you can do so from the remote control. There are additional options on the remote to adjust the width of these rollers. You can happily widen or narrow the space between the rollers to reach your desired target area on your back. At this price range, Kahuna could have incorporated at least 2 zero-gravity positions but the number is limited to one in this SM7300 model. One reason we could say for having only one zero-gravity position might be because of the space saving design. The distance between the wall and the head section of the chair, when in zero-gravity position is mere 3 inches. This is ultimate space saving design in first place. Offering either 3 or at the most 4 auto-massage programs is a norm with massage chairs. However, Kahuna SM7300 offers altogether 5 massage programs. Of all the above, Yoga stretching gets a special mention as it has gained immense prominence off late. While regular massage is focused around providing either muscle relaxation or pain relief around critical pressure points. But muscles and ligaments around hips, upper body (neck, shoulders), arms and hamstrings remain contracted with time. Regular stretching of these muscles helps avoid muscle wear and tear in the long run. And Yoga postures enhance muscle stretching and ligament movements that are essential to avoid injury risks. In addition to the above, there are 4 more customized massage programs made especially for employers, sports enthusiasts and senior. 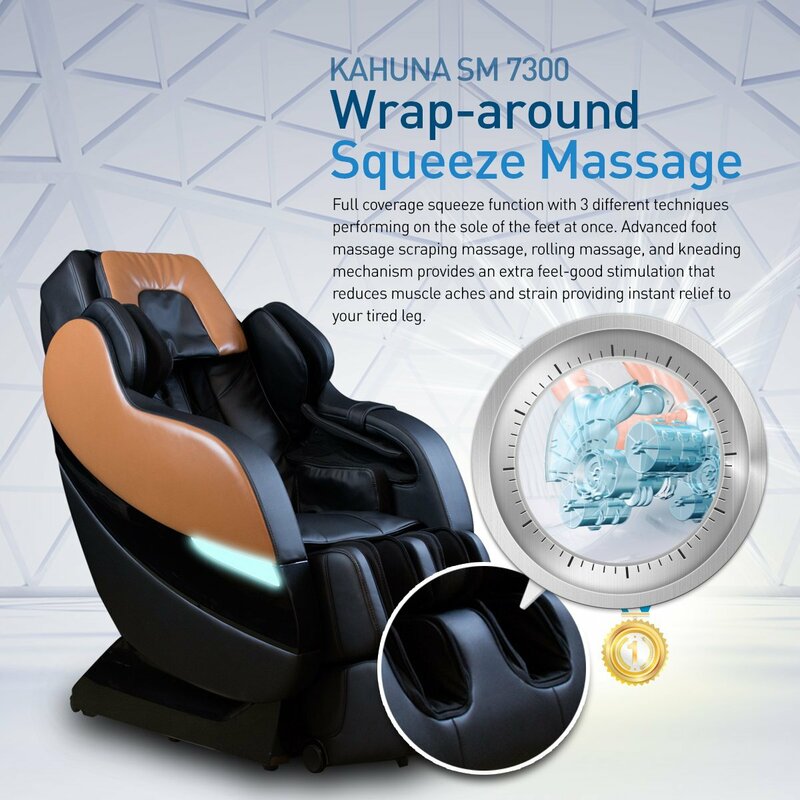 Kahuna Superior SM7300 has all types of massage techniques. However, knocking + tapping is the only combination technique offered. There is no match to the adjustability options offered by Kahuna Superior. It has distinct options for both roller massage and air massage. Full body massage is not always needed, sometimes you might just want the massage to focus on shoulders and neck area, or on the upper and lower back or just on your legs, calves and feet. This roller adjustability is supported in Kahuna Superior, you can simply select full, partial or fixed point massage. 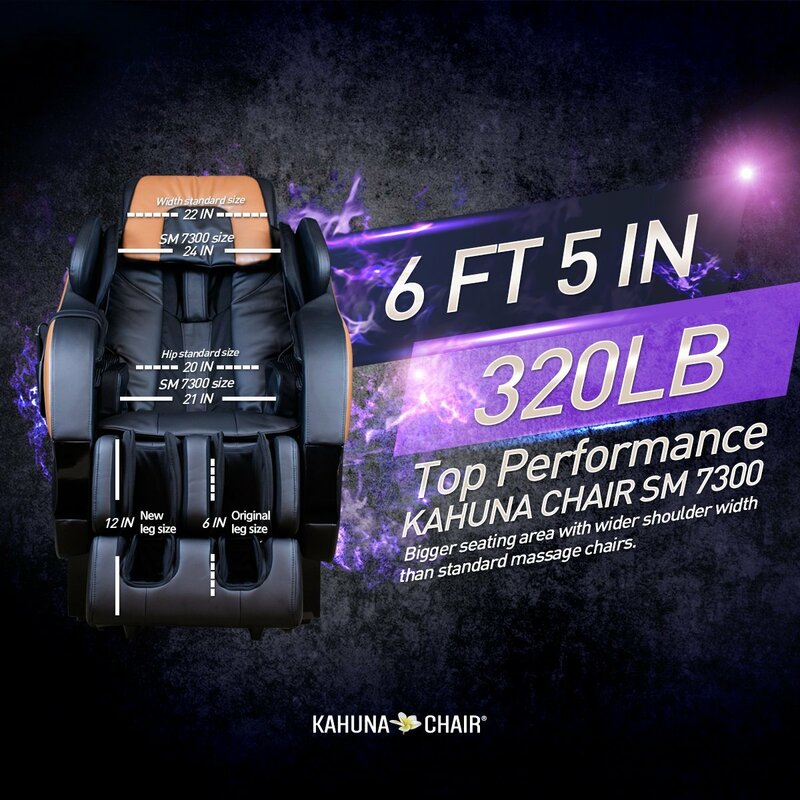 Although the 4 special programs are specially made to focus on certain sections in your body, but in addition to them Kahuna SM7300 also offers these adjustability options. For example, the Office Person option is for shoulders and neck, the golfer is mainly for the lower body from legs to feet. The dynamic sports option is high-intensity massage for overall muscle relaxation after a long and tiring sports activity. Similarly, there are 4 separate options for controlled air massage across different body sections. You can select between upper body (shoulders and neck), lower body (legs, calves and feet), middle sections (around hips and lower back) and overall body massage. Instead of having standard intensity levels for all types of massage, Kahuna Superior comes with different intensity levels for roller massage and air massage. While there are 3 speeds for roller massage, air massage has 5 different intensity levels to choose from. When you suffer from acute lower back pain, roller massage might not immediately offer the much-needed solace. However, when massage techniques are combined with heat therapy, muscles respond quickly giving you best and instant results. Kahuna Superior has heating pads embedded in the lumbar portion of the backrest. This heat therapy can be turned ON/Off as per your massage need, but somehow there is no option to adjust the intensity of heat. It’s rather a common issue with almost all massage chairs, no matter whether they are low-end or high-end. 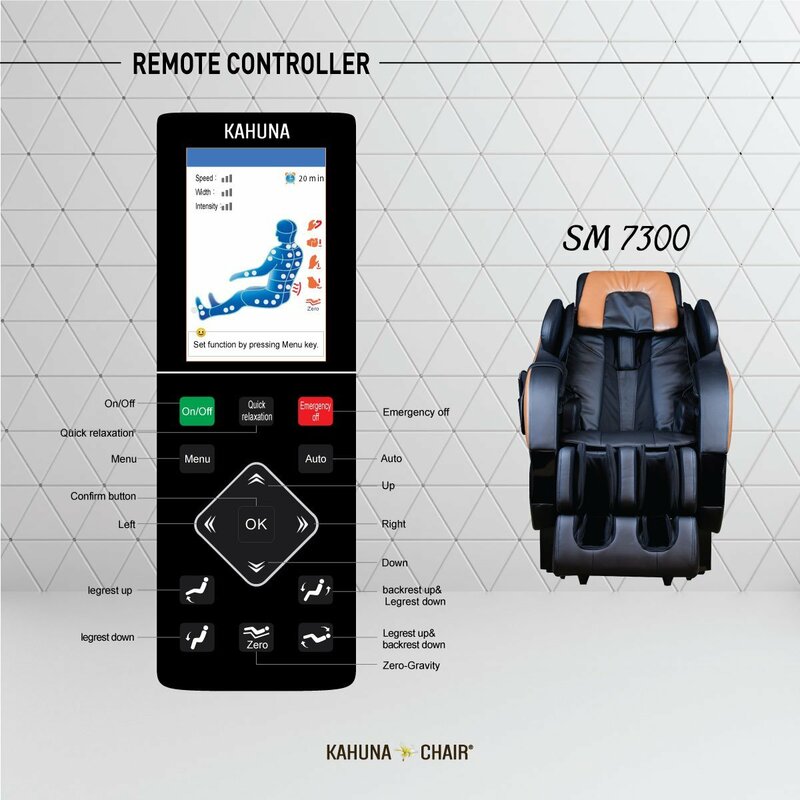 Kahuna has adopted the new air massage design in this SM7300 model. As per the design, there is no need to stuff 50 airbags in every nook and corner as seen in traditional massage chairs. Kahuna embedded second-generation airbags, as less as around 18, in neck, shoulders, hips, arms, leg calves and feet. As mentioned in massage intensity section above, air massage has dedicated adjustability options that are different from roller massage speeds. 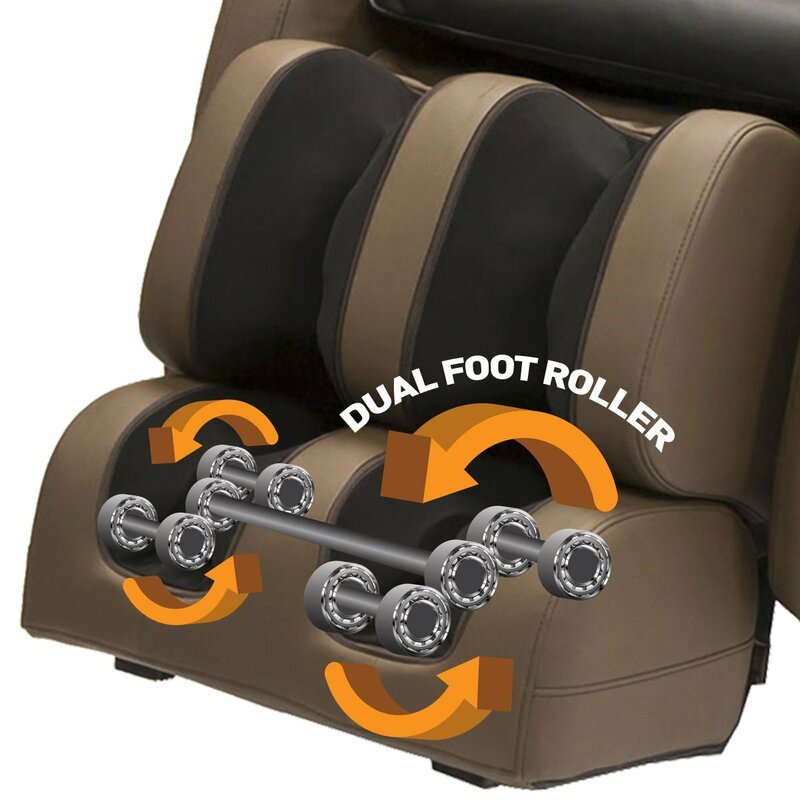 Airbags have 5 intensity levels to choose from while roller massage has 3 speeds. There is more to lower body massage than the usual airbags around calves and airbags plus roller in the feet section. Alongside rolling, there is kneading massage for feet soul. And the biggest takeaway is the scrapping function around heels and top of the feet. Kahuna, being a reputed brand in massage chairs category, a lot goes into its research and development (R&D) for critical design and quality. Perhaps, this is why Kahuna’s products register record number of sales with top ratings/reviews and positive customer feedback.